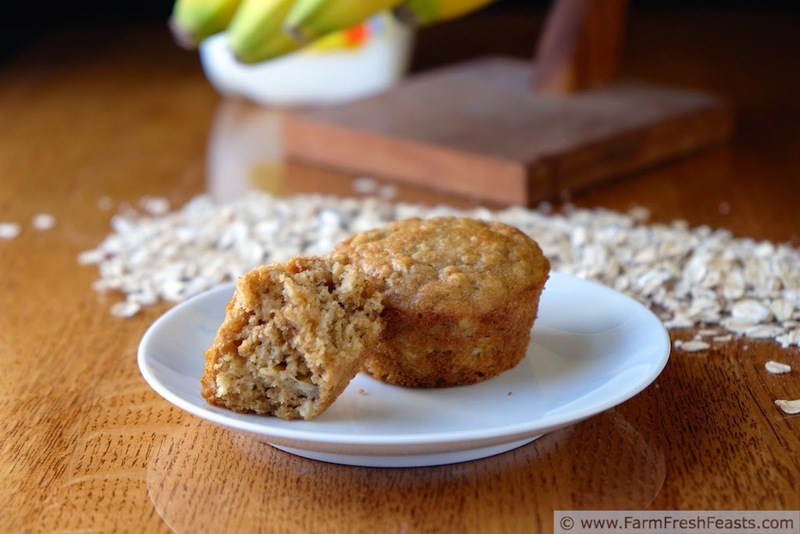 Soaked oat and whole wheat muffins sweetened with honey and a banana. When I was a kid, my mom would sometimes whip up a last minute dessert that consisted of a bowl of sliced bananas topped with a spoonful of brown sugar and a generous splash of milk. It was fast, sweet, and used stuff she had on hand. Making something out of nothing is a learned skill in the kitchen. I don't mean literally nothing, this is not a Stone Soup type post. 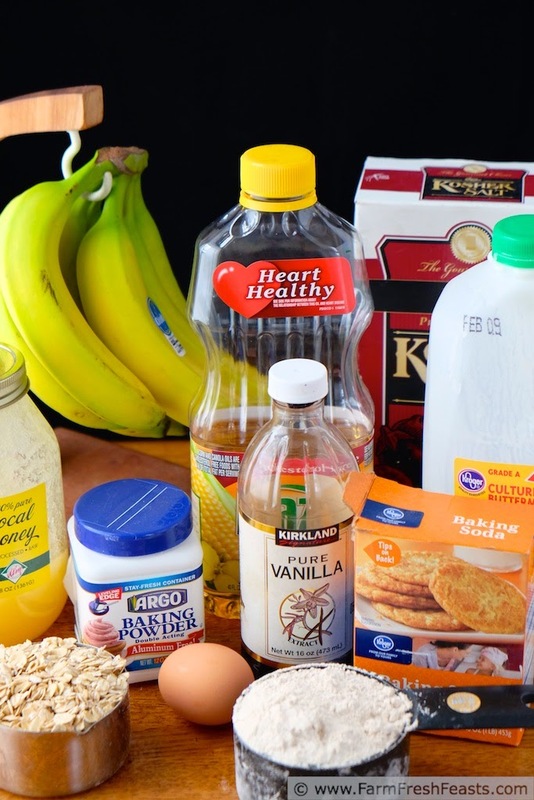 No, I'm talking about some of the items I consider kitchen staples: bananas, oats, and baking powder*. I don't add buttermilk to this list because if you were to run the stats [I've been working on getting my info ready for my wonderful tax preparer so stats are on my mind] buttermilk cannot be found in my fridge as often as bananas, oats, and baking powder can be found in the pantry. Once you've got buttermilk to use up, though, you can assemble several sets of the base of these muffins and store them in the fridge for up to a week. You could make buttermilk pizza dough or roasted garlic & pesto buttermilk pizza dough and store that in the freezer for a month. You could make a double batch of Butternut Squash Waffles and freeze the extras for weekday breakfasts or waffle sandwich lunches. These muffins are my version of mom's frugal dessert. They are easy to throw together out of stuff I have on hand, sweet enough for a mid-afternoon snack at work, and healthy enough for me to give my kids for breakfast. For other recipes using bananas, please see my Banana Recipes Collection, part of the Visual Recipe Index by Ingredient. For other muffin recipes check out the drop down menu on the right sidebar and let this serve as a kick in the pants to update that, or just tell me to put all the banana muffin recipes that are piled up on the dining room table into an ebook so you can grab that when you're in a muffin mood. Up to 5 days in advance of baking, but at least 1 hour before you wish to start baking, combine oats and buttermilk. If I'm soaking them for an hour I do it in the large bowl on the counter, if I'm prepping a bunch of soaked oat batches ahead of time I put them in a small container and chill. When you're ready to bake, preheat oven to 400 degrees Fahrenheit and spray a muffin pan with oil spray. 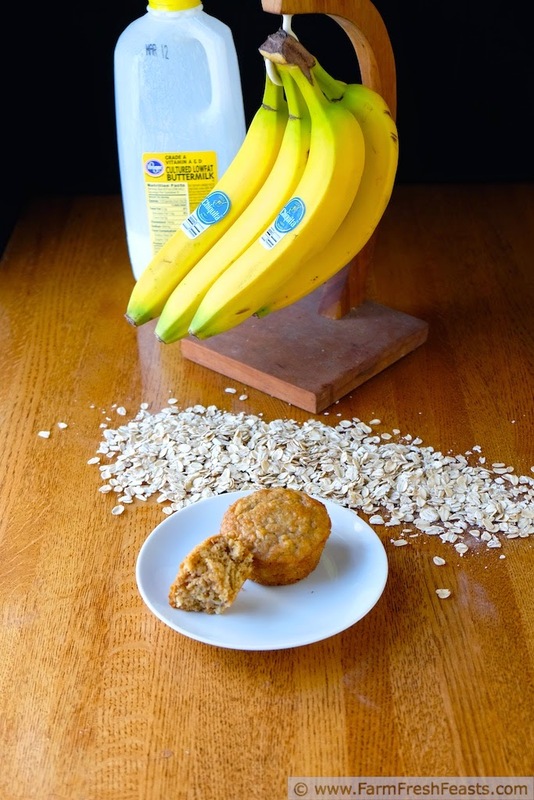 Combine soaked oats, banana, egg, honey, vegetable oil, and vanilla in a large bowl. Dump dry ingredients on top, and stir until just combined. Scoop into prepared pan. Bake for 15 minutes, then cool in the pan 5 minutes before transferring to a rack to finish cooling. Good warm or cold and moist the second day. *To tell if your baking powder is fresh, please check out Laura's post: How to Tell if your Baking Soda and Baking Powder are fresh. In the fall/winter/spring I'm making muffins weekly, and in the summer we have waffles often, so I run out of baking powder well before it goes bad. 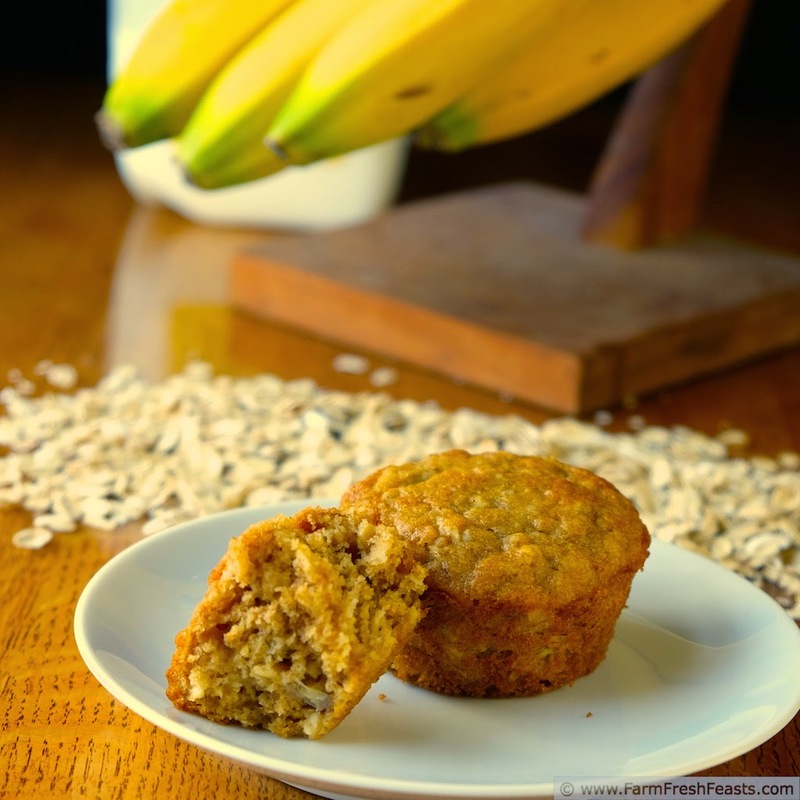 We all love just about every kind of banana bread or banana muffins at my house. Your version looks great. My kids will eat almost any kind of muffin--they are still waking up most school mornings--but they prefer banana-containing ones best. Love how you sweetened these muffins. I usually think that most commercial muffins are too sweet, and that muffins don't need to be a full-on dessert worth of sweetness. (Let's not even get into the size factor!) I've trained our taste buds to appreciate a less sweet muffin with the honey and banana flavors really standing out. I'm not sure which I prefer--honey or maple syrup--when I'm making muffins without sugar. 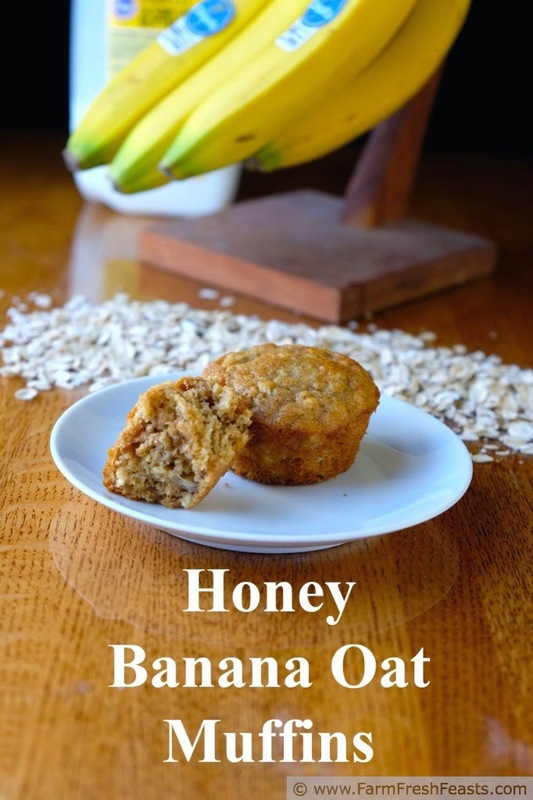 Both add their own special flavor, and in this recipe the honey pairs very nicely with banana. I have everything to make these...and I'm hungry...I'm off to make a batch. Seriously. Yum! Your muffins look amazing! I really like how you sprinkled oats on top--that's a nice touch and I'll do that next time. I adore all your muffins, especially the buttermilk soaked oat ones. They've spawned entire muffin creations for me, most of which involve bananas in some fashion or other because they rock. Plus, bonus points for phallic fruit. Spawning and phallic fruit. I've met you, so I know you are not a 13 yr old boy. I'm not sure what my fascination is with buttermilk soaked oats, but I'm good with it. Due to an unfortunate antibiotic incident in my youth, I cannot stand artificial banana flavor. A flavor chemist friend clued me into the science behind it--so I know I'm not crazy. However, real bananas? Those I am all over. Perhaps ripe pears would substitute? I never realised muffins could be used with buttermilk until i read one of Meg's a few weeks ago- These look delicious! Making muffins is the primary reason I pick up buttermilk, especially when I see it with a magical markdown sticker slapped on top. Got a half gallon for 15 cents once. It was awesome.